Here at Bullet Accounts, we like to make Accounts stuff easy, or at least look easy. We did all the had work, so you don’t have to. We took the difficult aspects of Accounting for your Business and camouflaged them behind a pain free Accounting Dashboard. Some people look for Book-keeping courses or Accounting Courses to postpone hiring an Accountant. If you’ve got Bullet Accounting, you don’t need the Accountant or the training to do your own book work. John Farrelly came up with the idea for Bullet Accounts Software after his Accountant neglected to inform him of important tax deadlines, costing him a fortune. Frustrated and a bit worse off, he set out to eliminate this problem for himself and others by designing a new kind of Accounts Package. This new Accounts Software would eliminate the need for an Accountant to do the day to day book-keeping of a Business and Automate the Irish Tax Returns Process. John Teamed up with Peter Connor with the aim of designing a sophisticated Accounting, Payroll and Tax machine that could be mastered by anyone. This Accounts Machine emerged in 2012 to disrupt the Accounts Software landscape in Ireland. 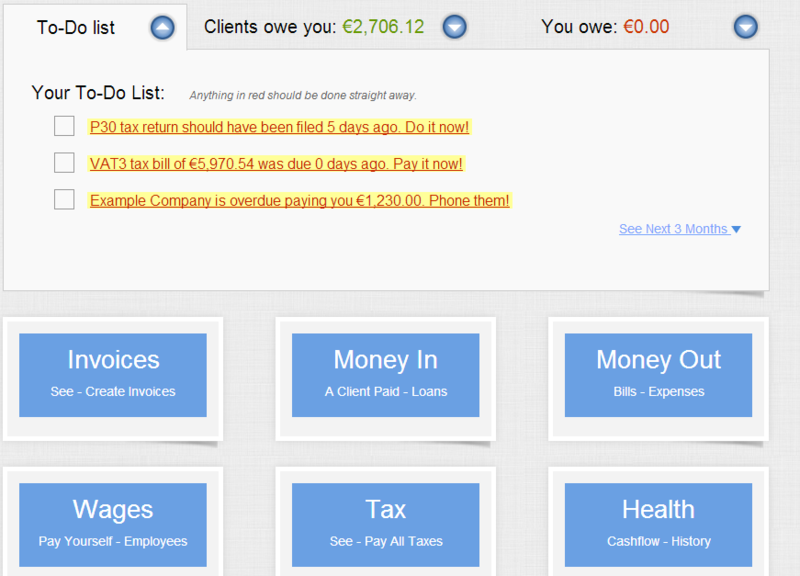 No other software on the market took the Accounting out of Accounts, and automated Irish Tax Compliance. If you’re unfamiliar with Accounts Software, Bullet makes it look incredibly simple. And it is. There’s a full Double Entry Accounts System working hard for you in the background! Bullet Accounts automates your Tax Returns, so you’re fully compliant and never miss a deadline. As soon as you log on, upcoming Tax Return Deadlines, money due in and to be paid out totals are displayed. This is an instant, up to the minute view of your Accounts, that you would often have to wait weeks to get from your Accountant. With Bullet Accounts you can see a snapshot of your Accounts, any time, anywhere. You’ll never miss another deadline and you’ll avoid those pesky fines and interest. Every time you post an invoice, record a payment in or out, pay wages, VAT or Income Tax, Bullet is looking after the Accounting and Tax Return Processes for you in the background. The VAT and PAYE rules are built into the system and automated. You don’t have to even think about it! When you create an invoice, these get a hit: Sales Day Book, Debtors Ledger, VAT Return and Balance Sheet. When you pay your workers Salary, this happens: P30, and P35/L Returns are instantly hit with the right numbers and your To-do list is updated. Revenue Return Forms are filled in as you pay wages, create invoices and pay bills. They are ready to be uploaded to ROS at all times. These are just a few examples of the things an accountant used to do, and you’re doing them yourself now just by creating invoices, recording payments from your customers, paying your bills etc. When you’re a Bullet user, since you’ve got the book keeping done, your Accountant can provide Added Value Services such as Tax advice, and Financial Planning. Click here to take a look around.